Many of our customers at Ramey Chrysler Dodge Jeep RAM FIAT are interested in getting extended warranty protection for their vehicles. We offer Mopar® Vehicle Protection to our customers to help extend their repair dollars as well as give them peace of mind. With Mopar plans, you'll get access to factory-trained technicians along with genuine Mopar parts and service. The Added Care Plus plan covers more than 800 different vehicle components that includes air conditioning hoses, lines and blowers, compressor clutch, evaporator, expansion valve, instrument control panel assembly and more. The Maximum Care package covers more than 5,000 components, including everything in the Added Care Plus Package. 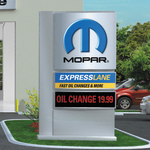 Both plans give you many additional perks that will make servicing your vehicle much easier. You'll enjoy a $35 per day care rental allowance while your vehicle is repaired. Other perks include a $100 towing allowance, key fob protection and $1,000 trip interruption protection insurance.